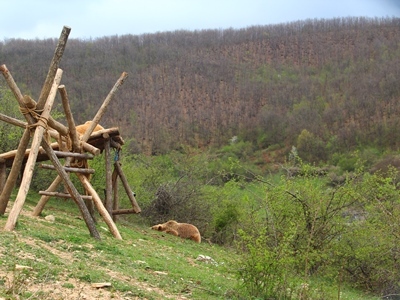 The Bear Sanctuary is a large place in nature, a twenty-minute drive outside Pristina, the capital of Kosovo. Drive for about twenty to thirty minutes in the direction of Gjilan and follow the signs. Visitors can park their car, buy a ticket for €1,50 (children till 14 years old: €0,50, babies for free), and enjoy a pleasant walk. The tour takes between 30 and 60 minutes. Note that there isn’t a lot of shade, so be prepared when it is a hot day. Around a dozen of bears live in the park. Some of them are inside, some play outside in the water, and a couple of bears are usually just enjoying the weather. Every animal has his own sign with personal information about his background and his actual behavior. Visiting hours are 10.00am to 08.00pm from April through October and 10.00am to 04.00pm from November through March. Because of hibernation, the park is closed for a number of weeks during the winter. In 2018, the park opens February 15th. More information is available on their Facebook page, or by calling +377 45 826 072, or by e-mail: bearsanctuary-prishtina@four-paws.org. 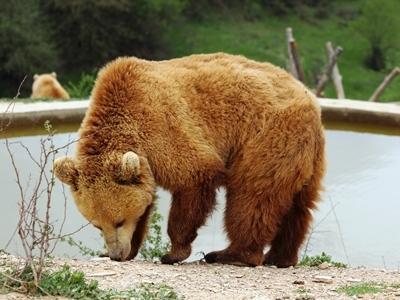 Before or after visiting the Bear Sanctuary, we recommend that you visit the beautiful monastery of Gracanica. This Serbian Orthodox site is well kept, and the church is filled with beautiful paintings and images. If you are lucky, someone will guide you through all the hidden beauty of this monastery. Gracanica is on the way to the sanctuary. You can find directions via this map. Close to the monastery, you will find the modern looking Hotel Gracanica, which is a unique place in the country. The staff is a mix of several ethnicities. It’s a good place to stop for a coffee, a glass of wine or a meal. A virtual tour is available online.